an appropriate title for a girl who naps a lot. And yet, somehow, hope abounds. Of people, plants, expanses and animals. of the Temple in Jerusalem. Is transformed into Jeremiah’s chaotic emptiness. And the chaos of destruction are linked. in the blueprint of creation. Upon the first twilight of creation. Each was created to counter the possibility of curse or destruction. Was the creation of hope. tucked away in the dark void. Much less imagine it exists. of being connected to the Jewish people. commanded to pursue the light of hope. God created a special kind of light. But it’s not the same light we see today. It is not the sun, the moon, or the stars. God hid it away from us. but does not exist at all. That’s when the light disappears. Is the great goodness of humanity. The light of hope still abounds. there is Torah, there is light, and there is hope. ** In memory of my buddy Vito Leybman, who emigrated to Fort Wayne from the FSU, and was tragically killed by a drunk driver in December of 1999. It seemed like the middle of the night. In sweatshirts and rumpled hair we would pile into the minivan and drive to the airport. We’d park our van and everyone had a job. My mom carried her guitar, my dad carried my sister, and my brother and I proudly held our homemade banner printed from a Commodore 64 on that perforated printer paper that is still perfect for banners. And as a family, we crossed the bridge from long term parking and headed to international arrivals. As my mom played Heiveinu Shalom Aleichem and a number of other families like us sang together these words of welcome, down the ramp came one of the many Jewish families from the Former Soviet Union who would make their new home in Fort Wayne, Indiana. As our families warmly greeted this family - the Kutsenoks - with bright smiles, books and toys, apartments readied for living, and support of many kinds, they looked truly tired, exhausted, and overwhelmed. Fort Wayne’s airport is called “Fort Wayne International Airport,” a title that is a bit of a ruse. But in my young mind, I imagined that this family had flown from Ukraine or Russia directly to Indiana in an almost clandestine trip that could only occur in the middle of the night. As it turns out, it was only perhaps 9:30. And the Kutsenok family who arrived on this particular night, exiting the ramp from the plane tried and grateful became good family friends. I grew up at Temple with Alex; his sister Anya was the same age as mine; our parents sang in the choir together. So the other day, I asked Alex, now a teacher in Miami, what their journey was like. In fact, they did not fly directly from Kiev to Fort Wayne. Their path, despite waiting many years to depart and frankly decades seeking religious freedom, their actual journey was rather quick. From Kiev to Moscow to NYC to Fort Wayne in a matter of 6 or so days. It was at a time when HIAS was still known as the Hebrew Immigrant Aid Society and when Jewish communities could sponsor Russian Jewish families directly. This scene played out numerous times in the early 90s, as I’m sure many of you recall. It had a profound impact on me because Alex came into my world, and Slava, then Vito and his brother Dmitri, and then Galina, and Natasha, and many others. Each one came down the airplane ramp, seemingly in the middle of the night, and into our lives. It seemed like the middle of the night. The sun set much earlier than usual. His hair was rumpled. He was tired. He had been walking for days. And amid a pile of rocks, Jacob lay his head down on a stone and he had a dream. In Jacob’s dream, a stairway - in Hebrew Sulam - was set on the ground, its top reached to the sky, and angels of God (malachei elohim) were (olim v’yordim) going up and down on it. The rabbinic sages go to town with commentaries on who these angels of God might be, whether or not this is a really a dream, and why this particular place where Jacob sleeps might be significant. Further, the image of Sulam Ya’akov - Jacob’s Ladder - permeates literature and pop culture. An Israeli short story goes as far to describe the angels going up and down the ladder high-fiving; there is an exercise cardio machine, called Jacob’s Ladder, that costs 4 grand; a 1990s horror film bears this title; there is a cut of beef, short ribs, referred to as Jacob’s ladder (Kosher, of course); clearly Jacob’s dream inspired Led Zeppelin’s “Stairway to Heaven”; and Jacob’s Ladder, akin to cats cradle, was a string game we played as kids. Most of these icons fit pretty solidly into the ladder imagery - the type with rungs that firepeople use in rescues. But Rabbi Mehlman, our Senior Scholar at Temple Israel and my professor in rabbinical school, illuminated for me the other day a different idea from another translation. In biblical scholarship, every translation for every word is in and of itself a commentary, espousing an opinion, or a particular academic approach to the bible and/or theology. When Scholar Robert Alter from UC Berkeley came out with his Torah translation, Sulam was not a stairway to heaven. Sulam was not a ladder. It was definitely not short ribs. Rather, Alter translates this profound scene in Torah - Sulam Yakov - as Jacob’s ramp. It definitely doesn’t have quite the same ring. In the footnotes, Alter points out that the word Sulam appears only once in all of Torah - in this week’s portion in Genesis. And Alter teaches it’s probably not a ladder. Rather, more likely the descriptive context uses language associated with the Mesopotamian ziggurat. A ziggurat, according to our knowledge of other cradles of civilization, was probably a vast ramp that stretched above terraced landings. Let’s focus further on this image of a ramp and those people who are maybe angels, maybe messengers, but beings of some sort who are going up and down - olim v’yordim - the Torah text reads. It is significant that these beings are able to move, to enter, to exit, to pursue, and to reach the heavens, too. And here’s the catch: the word olim, as a noun in Hebrew, means immigrant. Jacob himself, Alter teaches, was known “as a border crosser, a man of liminal experience.” And in this portion - he is on the go, like an immigrant or refugee of some sort. His dream, then, and the ramp signify potential. Taking Alter’s translation and adding it to our current reality, I read this story of Jacob’s dream and the Sulam Yakov, Jacob’s ramp, as a ramp to refuge. Spiritually and literally Sulam Ya’akov is potential. It is a ramp of access for refugees. The ramp of access to refuge for the over 60 million people displaced from their homes in the world’s largest refugee crises of our time is long and winding. Unlike the Mesopotamian terraced landscape over which a ziggurat ramp provided access, the opportunity to move up and down - olim and yordim - and through the world and into safety is, as we all know, quite harrowing. The long process of escaping one’s home, gaining refugee status, and then going through the many un-terraced levels of global and US bureaucracy is equally harrowing, indeterminate at best. And at any moment, one’s emigration process can be halted. And if you make it, thriving is the next challenge. We don’t yet know as our world shifts politically how refugee ramps will be impacted. Regardless, with our community here at Temple Israel and in Greater Boston, in partnership with JF&CS and HIAS, we are serving as a ramp of access for refugees. We are building a ramp of support to help them move from striving to be here to thriving here. We are not able to settle as many families as we would like. And yet, we will settle two families. Unlike my childhood experience, only a select few trained and skilled volunteers will ever have the chance to meet them and know them. We will hear more at the conclusion of services about how we can directly help build this ramp for refuge. In the meantime, the Torah offers us this spiritual message in order to sustain us in this unstable and unpredictable time. Build a ramp - or build a bridge, or a stairway, or a ladder, or a ziggurat. Build and find other builders to build with you. For those who seek refuge spiritually and those who are refugees most literally, ramp up your energy, ramp up your power, ramp up your voice. The flurry of metro traffic swirls by as the sounds of exquisite violin accompany the footsteps of Washington, DC’s, daily commuters. There is a yellow wet-floor sign a few feet ahead of him. People are sure to watch their steps to avoid the wet ground. Just one person stops, notices the exquisite violinist, applauds for a moment, and then runs to catch her train. Joshua Bell, the violinist virtuoso and an Indiana University graduate, plays in the l’Enfant Plaza metro stop, but most are too hurried to notice. There is midrash that teaches that so, too, did many pass by the burning bush of this week’s parasha- but only one stopped - only one saw the bush aflame - and he was the emerging virtuoso of the Jewish people - Moses. The 13th century Kabbalist Bachya ben Asher teaches that this is a moment of gradual awareness. Moses first sees a bush, then he sees it’s on fire, then he sees that it’s not consumed. Most people at the subway that day saw the yellow sign - Wet Floor- moved around it and raced down the escalator. maybe left some change in his case and then they, too, head down the escalator to the metro platform. There is, for moments, a gradual awareness of something magnificent in their midst. Now I’m not one who recognizes famous people even in movies I know they are headlining. Nor would I have recognized Joshua Bell - especially on a morning commute - but I wish to imagine I would have been like those who stopped because the music stirred something in them and in me. I wish to imagine the music would have sparked in me notice that something was afoot. In our parasha, the fire stirs something in Moses - his awareness sparked, his curiosity peaked. “Why doesn’t this bush burn up?” Moses asks. "I must turn aside to look at this marvelous sight…” When God sees that Moses has turned aside to look more carefully it is then that God calls to him out of the bush: "Moses! Moses!" 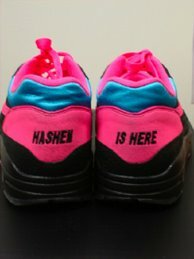 “Hineni,” Moses answers, "Here I am." His awareness more and more ablaze, Moses is able both to see and then to hear God’s voice. steer clear - this sign beckons us: pay attention, be aware, and come closer. But why must virtuoso Moses take off his shoes to fully experience God, the bush, and the moment? Shlomo Ephraim Luntschitz, a 17th century Chief Rabbi of Prague, who wrote the commentary Keli Yakar teaches that: "When wearing shoes, it is possible easily to tread upon small stones that are in your path, practically without feeling them at all. But when you walk barefoot, you feel every bump and obstacle, the jab of every thorn, the pain of every pebble. This is the reason Moses, leader of all Israel, is told: 'Remove your sandals.' The leader of the generation must be sensitive to every obstacle and snare along his path. He must feel the pain of the people and be sensitive to the snares they encounter." hoping we don’t miss the train, we will miss the bush, we will miss the fire, and we will not hear that call…that can bring us closer to one another and to God. Initially this blog served as a means to follow me through my first year as a Rabbinical student at Hebrew Union College, living in the holiest of cities - Jerusalem - with some of my best friends and new colleagues. Some of this writing was delivered at Temple Shir Tikva in Wayland, MA from 2012-2016. Now, I serve Temple Israel of Boston as rabbi and director of the Riverway Project. You can also check out a new 'work-in-progress' collection of prayers for Israel at Peace Will Come: a year of praying for Israel. Cafe Hafuch: Turning all you once knew Upside Down.